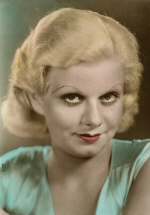 I love Jean Harlow and yesterday I made the first video on her tribute. I'm from Brazil! Here's the link to the video and, of course the way I see her: My Baby! This is a song I wrote about Jean Harlow to a Dean Martin remix. Original song to come. I hope you like it. :D I love your blog! Thanks for these videos, Lisa! Love 'em love 'em love 'em! This week has been... truly incredible. So happy to have been able to make the acquaintance of people I've admired for so very long, like you and Mark and, oh just everyone! And without your help, the Blogathon would not have been nearly as successful as it's been. I cannot thank you enough-- you're a remarkable lady and I know that Harlow's legend is in good hands with people like you bearing its torch!